All according to the Concussion Foundation, Chronic Traumatic Encephalopathy, or CTE, is a degenerative brain disease most commonly found in people with a history of repetitive brain trauma during an extended period of time. Due to the improvement of technology and modern medicine, CTE and brain trauma is being looked at closer than ever before. CTE has been prevalent for a long time without humans knowing about it. The most commonly known cause of CTE is playing the sport of football. I am unsure of the exact numbers, but CTE is being found in more than 50% of ex-NFL players. The studies collected by the NFL on former players has done a great justice to the football player himself, because it shows them what the real risks of playing the sport are. The studies which identify and help clarify what CTE is have been even more important. As I previously stated, CTE arises after a long history of brain trauma has been exposed to a subject. But CTE truly arises from a cellular level. In early onset of CTE, a protein called tau will begin to form clumps that spread in the brain, and this tau protein kills brain cells. Typically known as the “T” protein, tau has the job of stabilizing microtubules, which are tubular structures involved in shape and transport, found in the cytoplasm of cells. This protein is highly present in nerve cells, but not as much as in oligodendrocytes or astrocytes. It is the surplus deposits of this protein which develop the problem into CTE (News Medical). However, there is a discrepancy to be aware of when speaking about tau protein in the brain. Tau is also what causes Alzheimer’s, but the difference is that with CTE, the protein clumps up in the brains cortex. It also collects around blood vessels in the brain, which distinguishes it even more from other degenerative brain diseases (Concussion Foundation). One of the scary aspects of CTE is how early on in someone’s life they can get it. It has been seen in people at the age of 17, even though it is very rare. Most symptoms will start to develop in the 20’s or 30’s of one’s life. These behaviors include impulse control problems, aggression, depression, and paranoia. However, the more serious affects occur in the subject’s 40’s or 50’s, such as memory loss, confusion, impaired judgement, and progressive dementia (Concussion Foundation). There are four different stages of CTE, each progressively worse than the last. In Stage I, tau starts to build up in isolated parts of the cortex. Stage II involves a slight spread into multiple clumps of tau, now migrating to other areas of the brain. Tau clumps, or “hot spots”, begin to blend in with one another as it spreads to the hippocampus and the amygdala in Stage III. Finally, in Stage IV, tau becomes dense and covers the brain’s cortex and starts appearing in other regions, including the spinal cord (Concussion Foundation). The scary thing about CTE seems to be the fact that even though there are symptoms, it can sneak up on a person in a heartbeat. This disease comes about after all the “head banging” that the subject may have done, so they will not know if it is coming until it is already there. (1) Dr. Ananya Mandal, MD. What are Tau Proteins? News-Medical.net. https://www.news-medical.net/life-sciences/What-are-Tau-Proteins.aspx. Published October 20, 2014. Accessed August 31, 2017. (2) What is CTE? Concussion Foundation. https://concussionfoundation.org/CTE-resources/what-is-CTE. Accessed August 30, 2017. Ben DeCota is a first year student at Franklin Pierce from Rutland, Vermont. 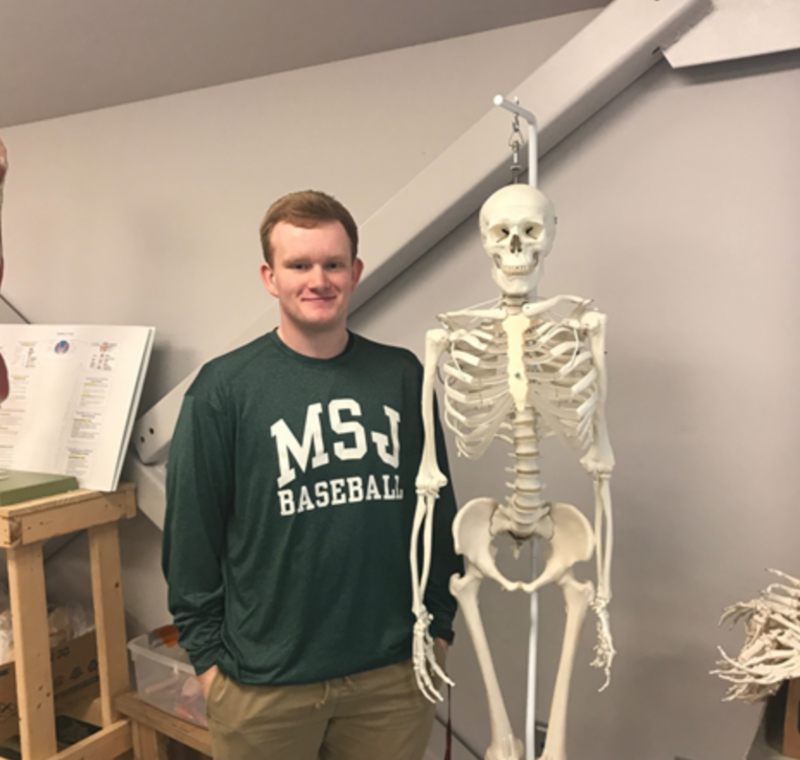 He has chosen to major in Health Sciences on the DPT pathway, looking to pursue a career in physical therapy after his undergraduate and graduate education at FPU.